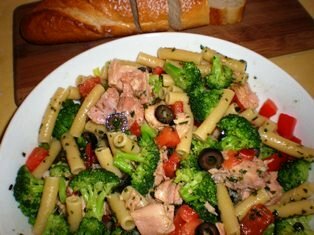 Penne with Broccoli and Tuna is a dish that you can put together in less than 30 minutes. reheated in a microwave for just a minute. Note that the recipe calls for canned tuna in olive oil. This type of tuna usually comes in 3 ounce or 5 ounce cans, or 7.5 ounce jars. It is sometimes labeled Tonno in Olive Oil. Place broccoli in a microwave-safe dish with 2 tablespoons water. Cover. Cook the pasta in boiling salted water under al dente. Drain and reserve 1 cup of pasta cooking water. Heat 3 tablespoons olive oil in a large skillet over medium-high heat. Add the garlic and red pepper flakes. Saute for 1 minute. Add the broccoli and saute until broccoli is tender, about 2-3 minutes. In a large bowl, combine broccoli mixture with pasta, pesto, scallions, tomatoes, and olives. Break up the tuna into bite-size pieces and stir into the pasta. Add some of the oil from the tuna. If the pasta seems too dry, add a little of the reserved pasta cooking water. Place pasta on a serving platter. Sprinkle with Parmesan cheese, if desired. In a food processor, chop basil, garlic, Parmesan, nuts, salt and pepper. Add olive oil slowly to make a medium-thin sauce. Inspired by the Umbrian region of Italy, this Deruta-style earthenware utensil holder is crafted in a style that dates back to the Renaissance.